In the midst of teaching, my mind often wanders to the great inspiration of Mr. Keating in the film Dead Poets Society. I first saw this film as an aspiring teacher and was so moved that I cried all the way home. There was something about those students standing up on their desks in support of their inspirational teacher, defying expulsion, that moved me deeply, . . . and still does. THEN I had religion, THEN I had a vision. / I could not turn from their revel and derision. / THEN I SAW THE CONGO CREEPING THROUGH THE BLACK, / CUTTING THROUGH THE JUNGLE WITH THE GOLDEN TRACK. They young men in The Dead Poets Society use this poem properly, I might add, using Lindsay’s own “stage direction” and do great justice to this rhythmical chant: they are simply using spoken language to honor the poets of old, . . . poets of all races. 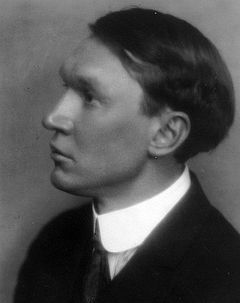 Furthermore, my take on “The Congo” generally coincides with the rest of academia that chides Vachel Lindsay for being a “well-meaning but misguided primitivist.” Ah, if there were just a way to put a more positive spin on this statement! I truly believe that Lindsay was doing the African-American race a great service, giving great honor to the absolutely superior rhythm of their music and, therefore, of their poetry. The reality is, however, that living in the turn of the century “white” world of the late 1800s tends to lend itself to decades of erroneous assumption, . . . even if he DID discover a very young Langston Hughes at a restaurant. It is incredibly important to note that Lindsay considered himself to be a staunch advocate for the African-American race! One wonders why his stress on “Their Basic Savagery” in this particular poem didn’t make him read between the lines just a bit. A link to the poem is included below, so you can see for yourself. The irony here is, it isn’t that the things in “The Congo” aren’t true, per se. (Could this be the very first instance of political-correctness?!?) It is simply the way it is presented that puts a focus more on the pre-industrialized continent of Africa (which, by the way, is not in itself a bad thing!) instead of the great advancements of the culture, especially in how it has influenced the culture of the Western world. Even though the language is pretty derogatory in today’s world, there does seem to be a strange feeling though that the poet actually does have some respect or at least sort of romanticizes the “savages.” I like that it is so lyrical, but to use “mumbo jumbo” and “boom boom boom” so much in a poem seems sort of naive to me. I have a hard time with anything that uses the term “savage” at all. I am pretty wary of anything that creates such a strong divide between and Us and Them. Hard to feel equal and respectful toward anyone that one sees them as Other. I know that the poem has to be looked at though in its context, and I cut it more slack when I do that. Very vivid in lyrical form. I was amazed further at Sarah’s take on the poem and how very similar it was to many literary critics because Sarah hadn’t been exposed to anything but the poem itself and, therefore, was not influenced by many critics’ persuasive language in the matter. To me this shows that, even from the standards of modern-day Tanzania, this older literary criticism of “The Congo” and consequently of Vachel Lindsay continues to ring true. I may never watch that Dead Poets Society primal cave scene quite the same way again!